During practice I was quickest and throughout the meeting consistently in the top three for setting the fastest times. I was consistently faster than the multiple-state champion. In the first race (out of a random ballot) I started in 3rd. At the start of the first race, I moved to the inside, but pole – who had moved to the middle of the track – cut back in front of me. This caused me to have to slow down. Due to being on the inside of the first corner I was forced to the outside of the second corner (which was in the opposite direction to the first) and pushed off the track. It wasn’t until the last part of the lap that I got back into momentum. At this stage I was in 11th. Slowly, lap by lap I forced my way through the field (for the remaining 9 laps). I passed a few drivers easily, but other times, I had to battle for the position. I managed to claw my way back up to eighth. In the second race (the reverse grid from the first) I started in 11th. In this race I didn’t have the best of starts, as I floored the throttle too fast and the engine bogged. I dropped to 12th. I gradually moved my way through the field. I didn’t have any trouble overtaking anyone, and I managed to get up to eighth in the ten laps available. In the third race I started in tenth (because two eighths in a row makes me tenth overall – weird). At the start of this race I got into eighth place. Soon after, I made a late move down the inside of the first corner to get into seventh. For the next three or four laps I quickly made my way closer to sixth place. I stayed behind for a lap, but after that, I managed to make the move and get to sixth. 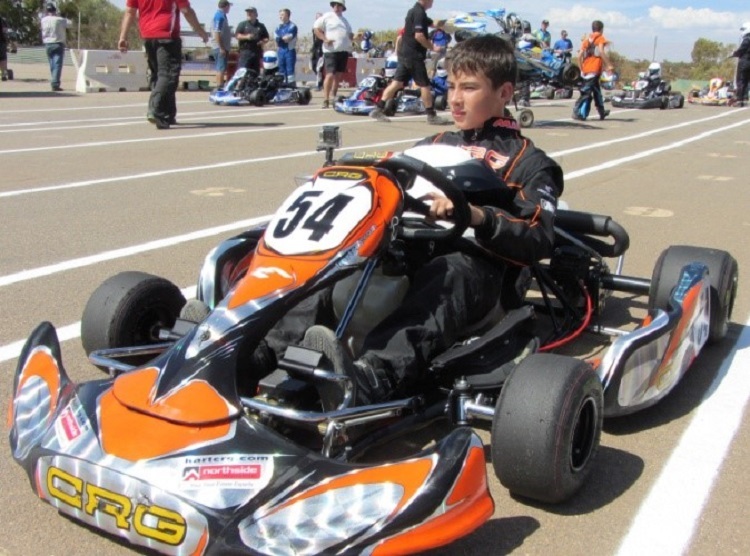 When I was in sixth, however, I was battling with the fifth placed kart. I spent four laps battling, until I ruined my exit in the tight hairpin after making a move, and I lost two positions to drop to seventh, where I finished. In the final I started in eighth. At the start of the race I dropped to 10th. From the very start of the race I had very little grip in the tyres, so I was struggling to keep up with ninth place. As the race progressed, my tyres overheated – due to the sliding caused by low grip – meaning I had even less grip. I stayed in tenth place and managed to finish the day in seventh overall.